Sidenote: I still have not finished up our Adoption Story blog post series; there are 2 more posts left for me to draft and post. Life has been crazy in our household lately and when I haven’t been working or dealing with the chaos at home, I haven’t felt mentally up to the task of blogging. Our daughters have therapy each week in Minneapolis. The older daughter does EMDR and the younger daughter does play therapy. I am usually “in session” with them for part or all of their session. Besides sitting in on/participating in their sessions, I usually have some “parent time” with the therapist. This gives the therapist and I a chance to “debrief” about their sessions and to talk about how they are doing. “Parent time” was very emotional for me yesterday. Lately we have had some very rough times in our household dealing with our RAD (reactive attachment disorder) daughter. It is exhausting, heartbreaking, and completely draining. I admitted to my daughters’ therapist that although I love my RAD daughter, I am having a really hard time feeling those “warm fuzzy” feelings for her right now. That is really hard to admit. My heart still breaks for my RAD daughter and I feel so much compassion for her. A couple of weeks ago, when things were at their “peak” of awfulness in our house (well, let’s hope that was the peak and that things settle down from now on), my friend and mentor, Stacy, graciously offered to take our RAD daughter for an overnight. Stacy has a daughter (Mckensey) who is 20 years old and has “left the nest.” Stacy told my daughter that she could go through Mckensey’s room and pick out some of Mckensey’s old toys to take home. My daughter could have chosen anything, but what she picked was so heartbreaking and so telling about where she is at as far as her emotional/developmental age. She chose a musical pull bunny. 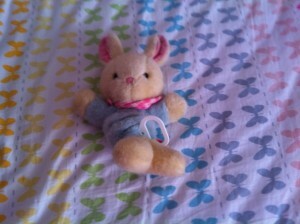 Our RAD Daughter’s musical bunny – thank you Mckensey! Then, this past Saturday, I went to a dear friend’s baby shower. A friend who is one of the first people I met when I moved into the dorms for my freshman year of college. It was a wonderful baby shower, and my friend is going to make an amazing mom – no doubt. My friend opened a gift, and it was a musical pull bunny; very similar to the one that my 9-year-old daughter is now using to fall asleep at night. At that moment, my heart broke a little bit. I looked around the room and saw my friends who already had (recently) become mothers; I saw my friends who I know will make wonderful mothers some day; and I looked at my friend who is expecting. All of their children (and future children) have hit the jackpot. Their children were so wanted, so planned, and my friends are preparing for and have prepared for their every need. My heart breaks for my daughters and for the other children like them. Although we do not know a lot about our daughters’ early years, we do know that they were neglected. Both of our daughters like to use pacifiers, drink out of baby bottles, be rocked and held like a baby, and be fed Goldfish Crackers, Teddy Grahams, and Cheerios by Eric and I as if they were babies (you know – where the parent actually “feeds” their child – like by playing the airplane game and putting the food in the child’s mouth). At 8 and 9 years old, they are asking us (Eric and I) to meet their needs that were very likely not met when they were babies. As I explained these feelings that I was having to my daughters’ therapist, and the sorrow I feel knowing that our RAD daughter especially seems to be in an infant/toddler stage emotionally right now , and how hard it is to deal with an infant/toddler who is in a 9-year-old’s body, I wept. I couldn’t stop the tears from falling out of my eyes and I couldn’t stop sobbing. I am drained right now. Completely drained. I get up every morning and I just keep on keeping on. I couldn’t ask for more supportive family and friends. But I am drained and I am filled with sorrow for the unfairness of life that allows some children to hit the jackpot and have amazing parents and for others – through no fault of their own – to be born to parents who neglect them, abuse them, and who lack the skills to appropriately parent their children.